Tired of hearing about what's going on in all of the big cities around the country? We have put together a panel of speakers from smaller agencies around the country to talk about the amazing things they have been doing in transportation. We will have some great speakers including: John Robert Smith, Former Mayor, Meridian, Miss. ; Mayor Chris Koos, Normal, Ill.; and Pepper Whittlef, Traffic Engineer, City of Pueblo. Each of these agencies is doing some great work that they will share stories about. 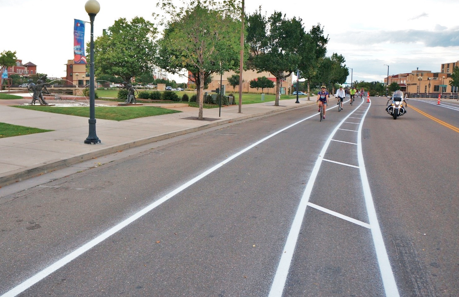 The photo above is one example of a recent City of Pueblo project.